Japanese Yew was added to our garden in early 2003, given by a neighborhood friend! About a foot tall then, it is now almost 4 feet in the same pot we first planted it in! It would have been much taller if I had not trained its single trunk to grow in a spiral fashion. However, what’s really amazing is its longevity where untrimmed leaves are as evergreen as we first saw them and still around after almost 5 years, truly remarkable! Even though, we’ve never seen its flowers or fruits, its beautiful foliage is enough to fascinate us, especially the contrasting bright lemon-green young terminal shoots against the very deep green matured leaves! Common Name: Shrubby Japanese Yew, Buddhist Pine, Yew/Chinese Podocarp, Podocarpus. 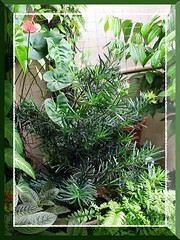 Plant type: An ornamental woody foliage shrub or tree, native to Japan and Southern China. Light: Full sun for best performance, though can tolerate partical sun to full shade. Moisture: Needs regular watering and moderately. Soil: Grows best in fertile, slightly acidic and well-drained loamy soil. Propagation: Can be propagated from semi-hardwood cuttings which is easy to root or germination of seeds which take up to 2 years to germinate! Features: As compared with the species Podocarpus macrophyllus that can grow up to 20-40 feet tall, this cultivar ‘Maki’ is smaller and more shrubby, hence commonly know Shrubby Japanese Yew. This evergreen columnar shrub or small tree is slow-growing and reaches 6-8 feet in average landscape gardens or when unsheared as high as 10-15 feet, and about half of that in spread. Like the yew shrub, it features glossy flattened needle-like leaves 1.5-3.5 inches long that are deep green and smooth-textured, and densely arranged spirally along its upright branches. Flowers are inconspicuous and its small fleshy reddish-purple fruits are edible and attractive to birds too. Usage: Very ideal as a foundation shrub, courtyard tree or an attractive outdoor specimen in gardens, landscape, pavement, street or along highway median. Excellent too as a screen or sheared hedge because of its dense evergreen foliage and slow-growing nature. Besides being an ideal plant for bonsai cultivation, this cultivar ‘Maki’ is also great as an indoor specimen in containers or as a patio container plant as it is smaller, slow-growing and tolerates low-light. It can serve as a good coastal plant as it is heat and salt tolerant. 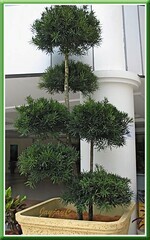 Its beautiful and long-lasting cut foliage can be used in flower arrangements, especially funeral basket. Care: A low maintenance shrub or tree that requires minimal care with easy culture. Light pruning if necessary to keep it bushy or trimming simply to shape into a round, square or conical shrub or as a topiary or hedge. 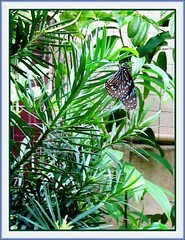 Scale and aphids may appear on indoor plants, otherwise no serious insect or disease problems. For temperate zones: Hardiness – USDA Zone 8-10. To know more, view this fact sheet from the University of Florida, Institute of Food and Agricultural Sciences (UF/IFAS). 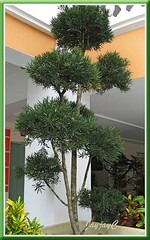 These potted Podocarpus trees are really tall, about 18 feet. Lovely examples of topiary art where the branches/stems were clipped and trimmed to create decorative roundish shapes. Seen at Wisma Lourdes, Church of Our Lady of Lourdes in Klang, Malaysia. 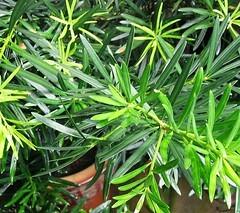 Another Podocarpus image. 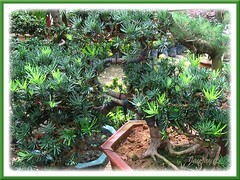 An amazing bonsai (dwarfed) creation seen at a garden center with a hefty price tag of RM2,500.00! Pithecellobium dulce ‘Variegated’ is so attractive! i have 4 yews across the front of my yard. they are several years old. now they are starting to turn yellow and the needles are dying on some of the branches. i do not know what the problem or solution is. do u have any ideas. I don’t know if you have already resolved the problems of your Podocarpus, but I will give some tips which I have learned from taking care and observing the same tree which I planted in my garden over ten, maybe twelve years ago. I planted the tree from a gallon can. I thought it was a cute little plant – I had no idea that it would eventually become a beautiful and large tree, if allowed to just grow by itself without proper pruning. 1) The leaves become yellowish and wilty in the heat of summer if I didn’t give it enough water. 2) Once, I over fertilized it and within a week, hundreds of leaves turned brown and died. I was so afraid that the tree would die. I literally picked the brown leaves one by one – it took me over an hour. My instinct to pick them one by one was right, because within two to three weeks, the naked branches grew new leaves. 3) I also noticed that they really needed to be pruned properly, otherwise where the leaves are crowded, they become sad-looking, dirty, and eventually, spiders will nest in them. I just take out the ones that seemed to be out of place. Also, the tree can be kept small if you want it that way; just cut the main branch and prune the lateral branches. In winter, I water it very little, and only when the sun happens to show up. And, never fertilize in winter. When spring comes, I fertilize and then wash the whole tree from top to bottom with my water hose to get rid of the grime and spider webs that accumulated all winter. 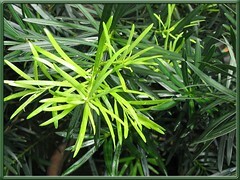 In my experience, Podocarpus is a hardy tree and easy to take care of. I must add that when I planted it, I made sure that there was enough compost mixed in with the soil in my garden. Thank you so much for sharing your experiences, Eva! Other visitors from the temperate region would definitely benefit from your insights too. God bless! Where I can I find seeds for this plant? I live in the UK and it is impossible to find the plant so i decided to hunt for seeds instead. If I pay for postage would you be so polite to post me some seeds from your tree?